On the evening of November 30, 2017 local time, Premier Li Keqiang met with Prime Minister Abdulla Aripov of Uzbekistan at the hotel where he stayed in Sochi. Li Keqiang said that China and Uzbekistan are close friendly neighbors. This year marks the 25th anniversary of the establishment of China-Uzbekistan diplomatic relations. President Xi Jinping met with President Shavkat Mirziyoyev, who visited China this May, and the two heads of state agreed to further deepen comprehensive strategic partnership. 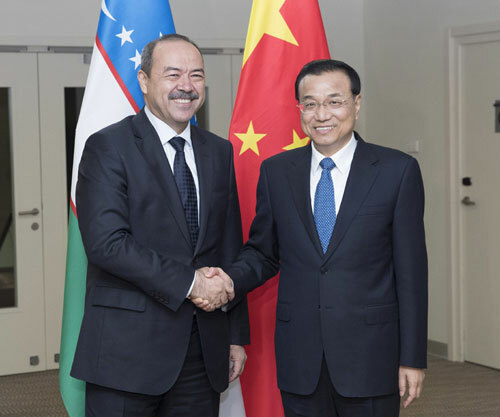 China-Uzbekistan cooperation enjoys a high complementarity. Both sides should strengthen the integration of development strategies, promote the steady implementation of projects on bilateral connectivity and production capacity, and create favorable conditions for enhancing cooperation between enterprises of both countries, so as to jointly push forward China-Uzbekistan friendship and cooperation in various fields for constant and substantial outcomes. The Chinese side is willing to further enhance communication and coordination with the Uzbek side within the framework of Shanghai Cooperation Organization (SCO). Abdulla Aripov expressed that China is an important cooperative partner of Uzbekistan. The Uzbek side stands ready to make joint efforts with China to strengthen cooperation in transport infrastructure, hydropower and other fields, in a bid to push forward the comprehensive development of bilateral relations and cooperation. Highly appreciating China’s positive role in the construction of the SCO, Uzbekistan stands ready to enhance bilateral cooperation within the SCO framework.